When I was growing up, April 1st was more than that day where I avoid everyone and everything, it was also our pets’ birthdays. If you don’t know when your pet’s birthday is and you want to do something special once a year for them, April 1st is just an easy day to remember. And the folks at BirthdayExpress.com have the most perfect party kit for the cat (or human!) in your life. “Glamour Cats” is an entirely real party kit that allows you to personalize your party supplies with your face or someone you love/want to embarrass. Unfortunately, you can’t use photos that don’t belong to you, which is why my face is on the plate instead of Ryan Gosling’s. 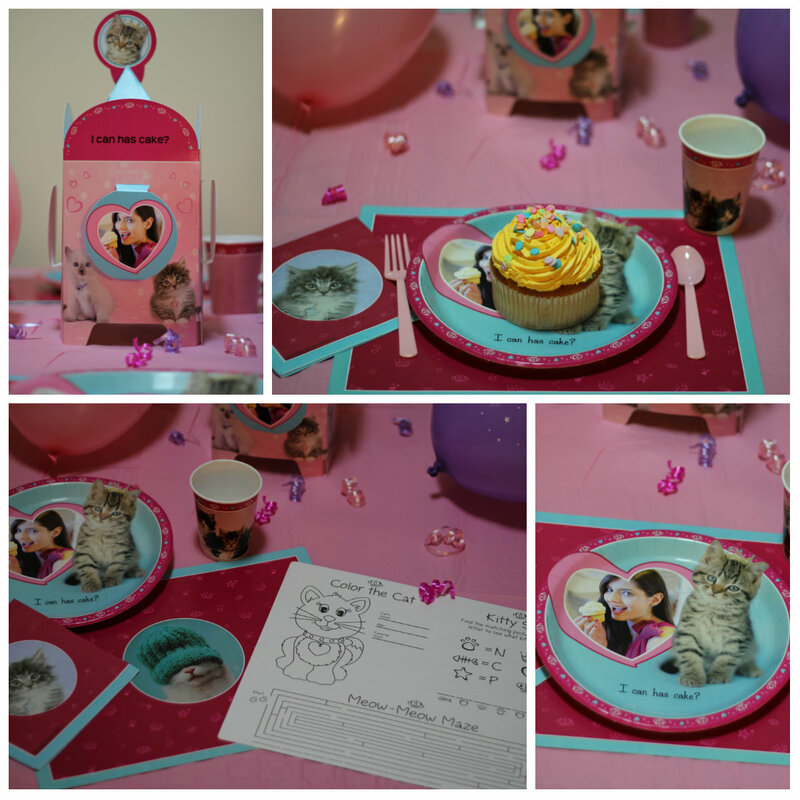 You can also create a custom message to go on the plates and centerpiece–I chose “I can has cake.” The Essential Party Pack will get you plenty of party accessories with adorable kittens on them, and then you can add whichever personalized items you want to that initial order. This party kit was most likely created with little girl birthday parties in mind, but I’m personally thinking outside of the box. Mid-week cheeseburger party? Bosses Day? Surprise Birthday party for your frenemy that hates cats? The options are endless! Plus, when was the last time you threw a party with a tablecloth, balloons, and streamers? Anyway, I know it’s April Fool’s Day, and I know some of you are thinking “this is an adorable but ridiculous idea. I don’t believe it.” Well, believe it. It’s real and also the best. You can get all your Glamour Cats needs for your Glamour Cats-themed birthdays at BirthdayExpress.com. You’re welcome. BirthdayExpress.com provided me with the party accessories seen in the photos in exchange for a review. The post and opinion are entirely mine. As is the photo on the plate/centerpiece. And the cupcake. It’s delicious.